This is the hat worn by the most famous Greeves Riders. Brand new Greeves logo is sewn right into the hat. Not a printed piece of junk, but the real McCoy. Only comes in one color, BLUE like a Greeves. Red, white and blue logo. One size fits all . $15.00 + $3.75 shipping US priority mail. Greeves Owners and Breeders Association T-shirt. Haines Beefy-T, high quality 100% cotton T-shirt will make you the envy of your VMX buddies. Dark blue with alloy-grey logo. Demonstrate your pride of ownership to the world and let people know you have your priorities straight. Available in large and x-large only. $15.00 + $3.50 shipping in US, call for international rate. We have literally thousands of pages of Greeves literature and factory publications too numerous to document here. Listed below are some of our more popular items. The History and Catalog of Greeves Motorcycles is the best place to start. It lists all of our available literature in addition to many other articles and information. As a Greeves enthusiast, one of the most important items to own is a parts book for your particular model. The Catalog will provide you with the necessary information to identify your particular model and determine which parts books you need. This is a 40 page History and Catalog of GREEVES Motorcycles. Lots of photos of restored Greeves bikes from around the world. Blow-up drawings, charts on diff. models and how to know what you have, lists of manuals and parts books, special tools. Restoration tips; its all here. $11.00 US + $2.00 shipping U.S., $4.00 shipping international. VILLIERS Maintenance Manual. 80 pages tells you how to do everything to the 30 series 200cc and 250cc engine and gear box, from rebuilding the crank to adjusting the carb. Lots of drawings of engine and gear boxes, charts and graphs. This book covers 9E through 37A. If you have an early Greeves, Dot, Cotton, james or DMW, you need this book; it has the answers to your questions. $15.00 US + $3.50 shipping U.S.. Call or submit request for international shipping charges. VILLIERS Users Handbook, (currently unavailable - call for info) Mint Condition, 1965, with Greeves Rubber stamp on rear cover, says Supplied by Greeves Motor Cycles, Invacar Ltd, Church Road, Thundersley, Benfleet. Essex. this is a book that was given to buyers of new Greeves. it covers all models from the 9E to the 36A. $12.50 US + $2.00 shipping U.S.. Call or submit request for international shipping charges. VILLIERS Parts Book. 40 pages covers Competition and road Vehicle ENGINES. models, 31C, 2L, 3L, 9E, 10E, 11E, 31A, 32A, 33A, 34A, 35A, 36A, 37A.blow up drawings of all parts, showing how they go together. All parts numbers, technical data. Different gearing clusters. everything you need to know about these great little engines. $12.50 US + $2.00 shipping U.S.. Call or submit request for international shipping charges. 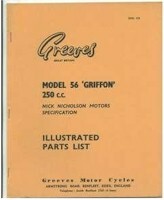 GREEVES Griffon #56 250cc parts book, "original", Mint Condition as sent out by the Greeves Factory. Shows all Frame, Wheels. Engine and Gear Box, Clutch, Carb, Special Tools, Etc. Great Blow up drawings with all parts numbers. If You own a Greeves 250cc Griffon you should have this book. $15.00 US + $2.00 shipping U.S.. Call or submit request for international shipping charges. COMPLETE set of Tank Badges, Greeves Great Britian, Union Jack Flags, Anglian badge for top of Tank. These are gas proof stick-ons. Perfect copies of the originals. Color matched. 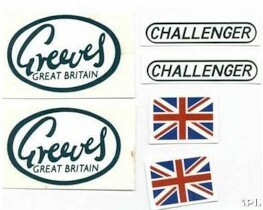 These are the same badges you will find on show winning Greeves. $9.00 US + $1.00 shipping U.S.. Call or submit request for international shipping charges. 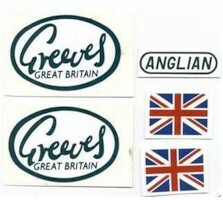 GREEVES Great Britian Tank Badges, Union Jack Flags and Challenger air box stick-ons. This is a complete set for a Greeves Challenger, perfect in every way. Fuel proof. Exact copies of the originals. $10.00 US + $1.00 shipping U.S.. Call or submit request for international shipping charges. Have your frame number ready. This number is stamped in the cast aluminum front down beam on the left side, right below the top. The exception is the Griffons models, numbered on the steering head. Obtain parts books for your particular year and model. The History and Catalog of Greeves Motorcycles list all of the parts books we have. This is why we recommend you begin with a reading of the catalog. Alternatively, you can call us with your frame number and we can determine what you require. Our price quote will be good for 30 days. After that period of time, better call again. Most of our prices are the same as 1973, when Greeves stopped production. However, we do have new parts manufactured for us. These include gas tanks, fenders, side panels, chain guards and the like. Naturally, these parts cost more than the originals, but surprisingly often don't run more than what you'd pay for a new bike equivalent. Our Guarantee: If you receive a part from us at anytime and are not satisfied with it, return it within 30 days, in the same condition you received it, and we will refund your money in full, no questions asked. This form will be sent to Ken Sykes who will get back to you as soon as possible.